At least six people have been killed in a car bombing at a local government office in Somalia's capital. Militant group al-Shabab claimed responsibility for the blast, which also destroyed a mosque and an Islamic school. 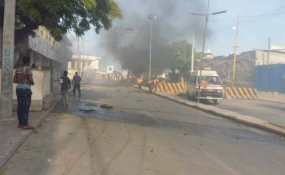 A suicide car bombing killed at least six people, including two children, outside a district headquarters in central Mogadishu on Sunday. Authorities said the attacker detonated his explosive-laden vehicle after security forces stopped him at a checkpoint at the gate of the Hawlwadag local government office. A spokesman for the mayor's office said the three soldiers who stopped the car died instantly, along with three civilians. Fourteen people, including the deputy district commissioner, were critically injured. Many of the victims were students at a nearby Islamic school that collapsed in the blast. A mosque and the local government headquarters were also brought down. Officials warned the death toll could rise. Islamist extremist group al-Shabab later claimed responsibility for the explosion. "We are behind the suicide attack," al-Shabab's military operations spokesman said. "We targeted the district office in which there was a meeting. We killed 10 people so far. We shall give details later." Al-Shabab frequently stages attacks in the capital in an attempt to topple the internationally backed government. In October last year, the militant group carried out a truck bombing that killed more than 500 people. In 2007, a 20,000-strong African Union peacekeeping force was deployed to Somalia under a UN mandate to bolster the government. Somali troops are meant to take over responsibility for the country's security in the coming years.